Sixty to 80% of children with Down syndrome have hearing impairments at some point during their childhood. As many of these youngsters are unable to identify and/or communicate this impairment, its very important that professionals working with this population diligently screen for hearing loss. The next section of this program includes some specific recommendations for the evaluation of hearing function at different ages. Some individuals with Down syndrome have sensorineural hearing loss, others have a conductive hearing loss because of frequent otitis media (infections of the middle ear), and a few have both types of hearing loss. Hearing aids can be extremely beneficial for many of these children, and nurses can serve a valuable role in coaching parents to encourage appropriate hearing aid use in their children. 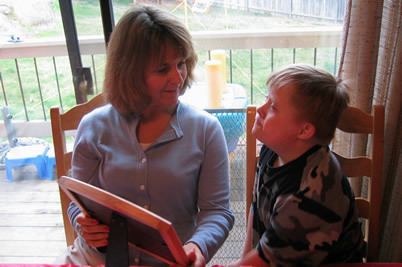 Nurses working with children with Down syndrome may be the first clinicians to detect subtle impairments in vision and hearing, and make referrals for evaluation and treatment. Impaired hearing and vision can contribute to behavioral problems, social isolation, and speech and language issues. Some impairments, such as sensorineural hearing loss, may not be correctable. Nurses familiar with the childs living situation can make valuable recommendations for telephones with amplifiers or enlarged buttons, headsets for use while watching television or playing CDs, and other adaptive strategies. Once they are identified, any of the hearing problems found in children with Down syndrome can be corrected. Because parents of children with Down syndrome are often dealing with a number of medical and developmental problems, visual impairments can be overlooked. Without good vision, the child is at much higher risk for developmental delays and can be more isolated from the environment. Nurses can help identify vision problems, and should encourage parents to follow the evaluation recommendations outlined in the next section of this program. Cataracts are common in older adults with Down syndrome, but are not an issue in early childhood.